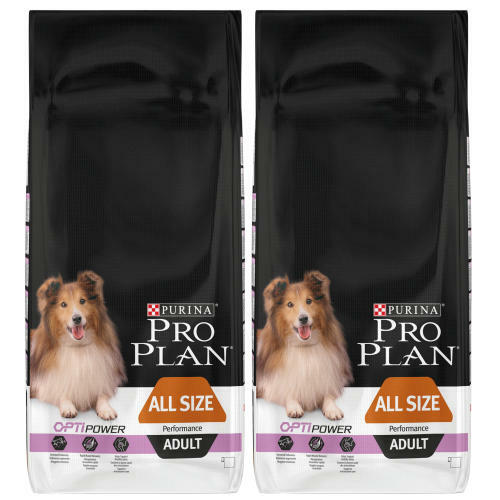 PRO PLAN OPTIPOWER Chicken Performance Adult Dog Food is sure to keep tails wagging! PRO PLAN DOG is a specially formulated dry dog food for active dogs and contains OPTIPOWER, a blend of nutrients designed for your dog's increased endurance and to aid rapid recovery. OPTIPOWER contains all the important nutrients an active or working dog needs to maintain their optimum condition. Key ingredients help increase endurance, support rapid muscle recovery and help support joint health. The protein/fat ratio is tailored to helps maintain lean muscle and an ideal body condition. As well as supporting particularly active dogs, PRO PLAN® DOG with OPTIPOWER is an ideal working dogs' food. It's suitable for all sizes of adult dog, as well as gestating or lactating females. To help keep your active dog healthy and full of energy as he deserves, feed him a dry dog food that truly caters for his needs. These amounts are guidelines only. To help keep your dog in an ideal body condition, adjust according to your dog's activity level, physical condition and individual needs. Clean, fresh water should be available at all times. To monitor your dog's health, consult a veterinary surgeon regularly. Pregnancy & lactation: please see PRO PLAN web site or ask your vet for more details.